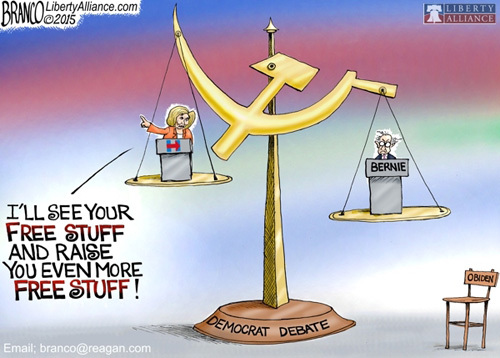 Bernie & Hillary both have a Big Government-Ideological Worldview that uses GOVERNMENT FORCE-POWER to confiscate the property-one's income-off the hard working Worker's of America to theoretically give to those in need...their philosophy is one of Stealing GOVERNMENT-GREED for Corrupt POWER! In 1776 Liberty was defined as FREEDOM from BIG Government in our lives! The inversion and perversion of our Founders' LIMITED Government-Constitutional-Federal Republican Worldview was initiated well over 100 years ago by Constitution hating Progressives like Teddy Roosevelt and Woodrow Wilson and then continued by FDR, LBJ & Hillary along with Socialists like Eugene Debs and Bernie Sanders. 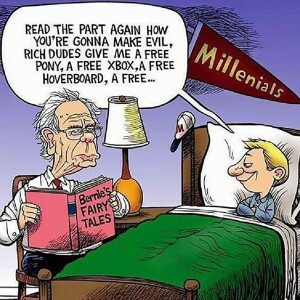 Sadly today too many ill informed and uninformed Americans, many of these are Millennials and Moochers in on the take, are complicit with BIG BROTHER GOVERNMENT as more and more hard working Middle-Class Workers of America suffer from over burdened taxes, bureaucratic boondoggled balderdash and BIG DC-Government confiscation of the fruits of their labor and invasion of the privacy of THEIR income distribution. Thomas Jefferson understood that the pursuit of happiness was always in jeopardy when the politicians utilized pretense and LIES to control the people. under the pretense of taking care of them." to guard the people against the dangers of good intentions.
. . . . . but they mean to be masters."